You have been tasked with increasing productivity and increasing quality, while at the same time lowering the cost of your manufacturing processes. The solution is to automate … but how? Identifying a manufacturing process that can be automated is often a daunting task. It requires a team approach to qualifying, validating, and then finally, implementing a program. This book takes you through the best practices for each step, regardless of the application type or the industry segment. It will show you how to achieve the system expectations that were planned for and benchmarked, and it will also help identify the most common pitfalls - all without having to eliminate employees. 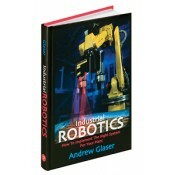 • Provides a broad, semi-detailed review of various robotic applications based on process, including machine tending for CNC machine, press brake tending, deburring, grinding, dispensing, and welding. • Incorporates existing articles, as well as the author's own knowledge to describe points of interest and background. • Illustrates points by featuring using an interview format between the author and the user or expert providing opinion and insight. • Features numerous illustrations, drawings, and charts in every chapter. • Uses case studies to describe points and features North American based examples. Chapter 1 - Why Automate the Small and Medium Sized Manufacturers (SMMs)?